Center height - 7' 7"
Minimum weight - 20 lbs. 3 oz. Whether you're family camping or just enjoying the good life in your own backyard, Eureka! screen houses, shelters, and solar shades provide excellent bug-free escapes from the sun during meal times and relaxation. Are there side curtains one can purchase for this item? Unfortunately, this does not come with or offer side curtains. Does this Eureka Breezeway shelter have a built in floor or does it sit on the ground? Thank you for your inquiry. The Eureka Breezeway Shelter is open on the bottom. Does this shelter have a floor? No, it does not have a floor. It is primarily designed to fit over picnic tables. No, the shelter does not have a floor. However, it has flaps that extend out a few inches to limit the entry of insects and water. If it's raining hard, especially with wind, you will still get wet. But, we've been dry during a light rain. We used it for the first time during a 2-week camping trip on an island that gets quite a breeze across and had no problems with its stability. It was a great addition to our camping gear and made a cozy, nearly bug-free zone to sit under to play games in the evening and eat our meals. A regular size picnic table fit nicely and zippers on 2 sides made for convenient entering and exiting. What is the warranty on this shelter? Do you sell a tarp that would fit on the bottom of it? Johnson Outdoors Gear LLC's aluminum pole shelter is warranted to the original purchaser that it is free from major defects in materials or workmanship for the life of the product, except as qualified below. The manufacturer is not responsible for normal wear and tear or for damages caused by shipping, accidents, misuse, alterations, or improper installations. Additionally, although the product is manufactured with quality fabrics, the manufacturer is not responsible for the negative effects of climate, pollution, acts of God, and long or semi-permanent installations. Because these shelters are temporary structures, it is necessary that any Johnson Outdoors Gear LLC shelter be installed and maintained according to the manufacturer’s instructions.What Johnson Outdoors Gear LLC Will Do: If after inspection the manufacturer finds that a product failed due to a manufacturing or material defect, the manufacturer will repair or replace the product, at their option, without charge. We sell many tarps that could be used under this shelter. I lost sleep one stormy night worrying that this product wasn?t going to make it till morning. I shouldn?t have worried. It was still in great shape the next morning. Great quality, great tent?highly recommended! Be sure you?re aware when you order this that the roof is smaller than the floor by about three feet, so when it rains you can?t really consider it to be 144 square feet of protection. Also, maybe it?s just me, but I don?t like the moir? effect you get when looking through the screens. It just bugs me and makes me kind of sick. I?m very happy with this purchase. It?s got everything I was hoping for. We can set up a table and eat inside with ease, and assembly and disassembly were easy to do. If you are looking for a nice screen house, I think you?ll be happy with this one. 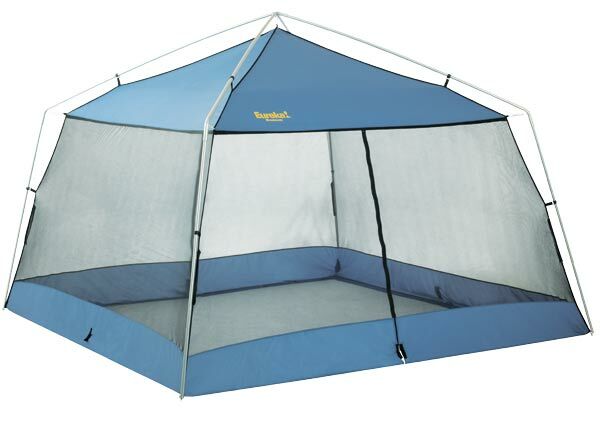 We love to go camping, and it?s really nice to use this screen house as a place to eat and to get away from mosquitos and other flying pests. The construction is great?it lasted through at least one bad rainstorm that would have destroyed other screen houses. If I ever purchase another screen house, I?ll stay with the Eureka brand.